The Tower Defense genre is regarded by many gamers as a grotesque derivation of the Real-Time Strategy genre; a genre replete with common contributions unworthy of attention. They’re right, of course — there are a lot of bad Tower Defense games. 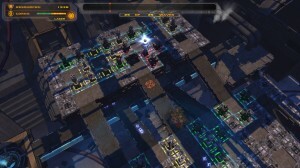 Hidden Path Entertainment’s Defense Grid: The Awakening, however, represents the genre’s potential. There’s an archetype that Tower Defense games adhere to, and Defense Grid is no exception. Waves of enemy units travel unimpeded along a path until players build towers to suppress them. Strategy is called for by the stipulation that, while towers can be built to redirect the enemy’s path (“mazing,” colloquially), towers can’t outright block the enemy’s path. Both units and towers have their respective strengths and weaknesses, so tower selection matters as much as tower placement.